TBA is offering two shows this holiday season-the beloved story of Scrooge, Tiny Tim and Bob Cratchit, A Christmas Carol, and a one woman play staring Morgan Mitchell titled A Christmas Eve with Laura Ingalls. 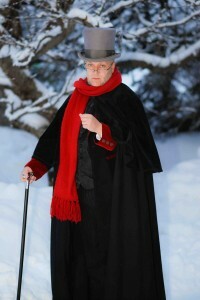 Wayne Mitchell, who plays Scrooge, drops by Stage Talk to let us in on all the action. ORIGINAL BROADCAST: Friday December 13th, 2013 at 2:45 p.m.